Borage Tincture organic herbal extract is an amazing healer for "broken hearts". 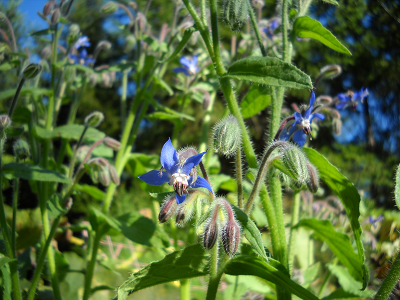 Borage has a traditional saying that has been passed through the ages- "I Borage Bring Courage". Borage is an adrenal tonic, it stimulates lactation and generally brings strength and conviction to one's beliefs. Mountain Maus' Remedies prepares our Borage Extract from the leaves of Borago officinalis plants which are organically grown on our own ranch without the use of chemical fertilizers, pesticides or herbicides. Our Borage is never fumigated or irradiated. To assure optimal extraction of borage bioactive compounds, the leaves are hand-harvested while the plant is in full bloom, are carefully shade-dried to retain their full color & aroma, and then thoroughly extracted. The herb is known to be rich in gamma linolenic acid, the Omega-6 Fatty Acid that is as essential for overall health. The herb is believed to act as a restorative agent on the adrenal cortex. In other words, Borage Leaf extract will revive and renew adrenal glands after medical treatments of cortisone or steroids. This explains the ancient uses for Borage to uplift and strengthen the spirits, especially in times of grief. Today's translation of this healing herbal extract is to help people deal with everyday stress and exhaustion. Borage Leaves are used as a diuretic to support treatment of urinary tract conditions and weak hearts, and varicose veins. Borage leaf extract has been used by herbalist in the prevention of cardiovascular disease, high cholesterol and high blood pressure. It is also used to soothe the body's mucous membranes, suppress inflammation and help ease arthritis and rheumatism. It has been advocated for other disorders such as ulcerative colitis and Sjorgren's syndrome. Borage has antibacterial effects against Helicobacter pylori, the bacteria that causes stomach ulcers. It has been used to increase breast milk production and is one of the most popular herbs among women for treating premenstrual syndrome (PMS), as well as menopausal symptoms. Borage has proved to be an excellent alternative medicine to cure fibrocystic breast disease due to its high gamma linolenic acid (GLA) content. The healthy fats are also used to delay male baldness naturally, as well as other types of hair loss. It also improves skin's water retention and provides nourishment to dry or damaged hair. As an anti-inflammatory, it is said to also help to relieve inflammatory conditions such as eczema, seborrheic dermatitis and other skin conditions. Some believe that Borage leaf herbal extract may be the perfect remedy for treating a hangover or preventing them. Borage herbal remedies are also excellent for the treatment of individuals with nervous disorders such as excessive apprehension, persistent worry or anxiety, including mild to long term depression, which is affecting many people these days. It has been found that high-dose, concentrated omega-3 fatty acids have effective mood stabilizing and antidepressant effects on people with bipolar disorder. Borage is thought to be a gland balancer that helps to regulate hormonal systems and is said to be effective in helping to relieve depression and mood swings. Borage helps in the prevention and treatment of many female conditions, like PMS, female infertility, endometriosis, hot flash, cramping during ovulation, breast tenderness, swelling and bloating from water retention and other problems. During the period of menopause in women, estrogen production is taken over by the adrenal glands and Borage Leaf liquid extract is very effective and useful in the stimulating of this gland as this crucial juncture. Externally, Borage has been used in eyewashes, gargles, mouthwashes and poultices, but contact with the leaves may cause dermatitis in sensitive persons. Ingredients: Certified Organic Grain Alcohol and Organically Grown fresh flowering plant of Borage (Borago officinalis). Precautions: The plant (but not the oil) contains small amounts of pyrrolizidine alkaloids that may cause toxicity in the liver, and Borage should never be taken in large doses (many times the recommended amount) or for a long period of time. If you are taking any blood thinning medications, speak with your doctor before using Borage. Click the button below to add the Borage Tincture to your wish list.